I’ve always been attracted by computer displays with large screens. The more pixels and colors, the better. When I was offered the opportunity to review the NEC EX341R-BK I jumped on it. 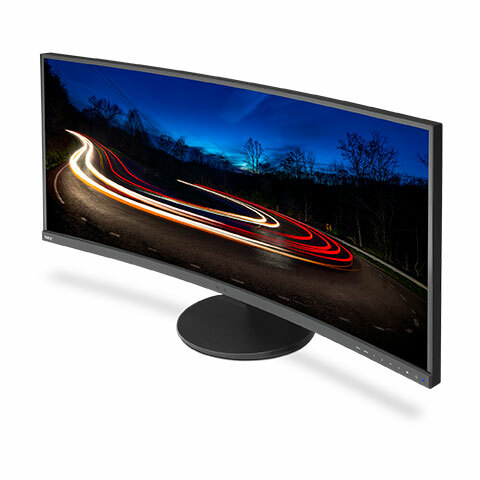 The NEC EX341R-BK is a 34” display with a resolution of 3440×1440 pixels. Compared to most 27” displays that have 2560×1440, it is almost 25% more pixels on screen. 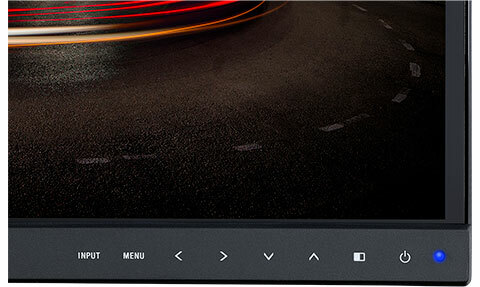 The unique feature of this display is it’s curved to create a more immersive experience for the user. Considering the size of the screen, it sounds logical that curving the screen is a good idea to prevent eye strain. While it looks good on paper, I realized that the distance we use a computer display versus the curve of the display may be deceptive to the brain. It is not a 60 feet wide cinema screen that we look at from 30 feet away. The NEC display made straight lines curved from my perspective, such as: horizon lines in a picture, a separator line on a web page, or even a Finder window. I thought I may adapt to it eventually, but even after a few weeks, I still find it somewhat confusing for general usage, and worse for image editing. 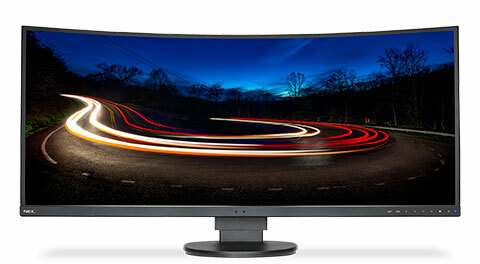 Considering the size and weight of such monitor, the base has to be very sturdy, and NEC delivers in this regard. The base is very solid and heavy with a smooth mechanism to adjust the display height and angle. If you want to suspend it to a movable arm, it also supports VESA mounting. The base is also a cable management system to prevent cable cluttering on its back. The display has a very limited number inputs and outputs. Considering the number of pixels, VGA and lower grade connectivity are almost useless. To connect your computer, you have to go with DisplayPort 1.2, HDMI 2.0, or HDMI 1.4 as choices. It also provides a DisplayPort out that can be used to daisy chain a second monitor to it. If you want to use this feature, make sure your video card supports MST (multi-stream transport) mode. My MacBook Pro with retina display 2012 does not, so I could not test it. 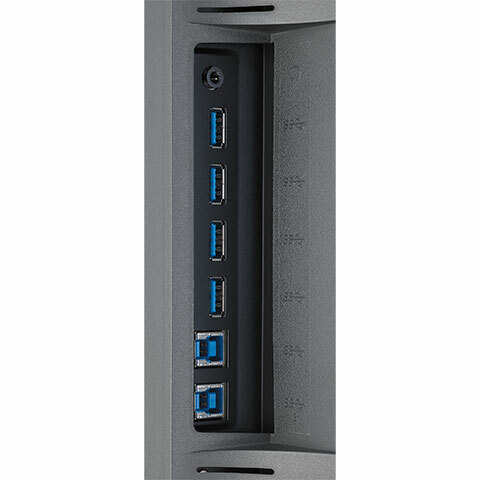 The monitor also provides four USB 3.0 downstream ports, and two USB 3.0 upstream ports. 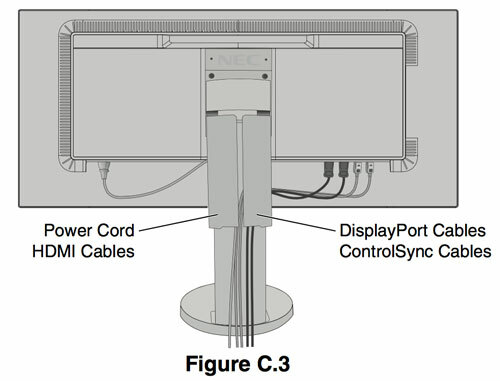 The two upstream port means you can share the display and USB hub with two computers, yet only one computer at a time, which can result in data lost of not done properly. The display is also equipped with stereo speakers of 1W each. They are okay for computer sound alerts, but for more general purpose music listening they are tolerable at best. On a Mac connected with DisplayPort to the monitor, you can route the sound directly over the display cable (in the System Preferences), but Apple’s way of implementing it is lame, and you lose the possibility to adjust the volume with the keyboard keys. You have then to rely on the OSD (On-Screen Display) menus to change the volume or use a hack to bypass macOS default behavior. I often do photo editing with my computer which requires color accuracy. I have a Dell U2713H display and when I compared it to the NEC monitor, there was a clear gap in color matching. I calibrated the NEC display with the Spyder calibration device I reviewed a few years back, and I got better colors. 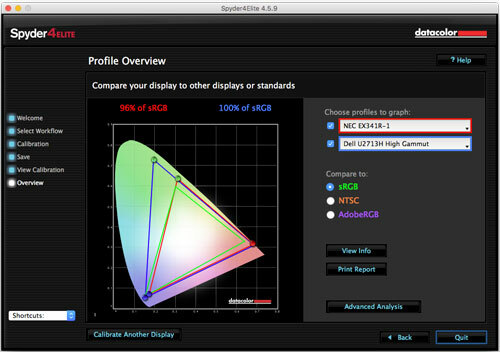 As you can see in the Spyder profile overview, the NEC display can only display 96% of sRGB while the Dell offers 100%. The U2713H has high-color gamut, which the NEC doesn’t have. For most users it may not be something to worry about, but for color critical tasks, it may affect your workflow. In my case, I could clearly see that both displays had a color shift in between, making it impossible to use them in an ideal workflow for photo editing. To conclude this review, I clearly see the advantage of the NEC EX341R-BK for general office usage. Especially for people using the display to work on huge Excel workbooks, the larger screen will offer an opportunity to see all your data without side-scrolling in the spreadsheet. This could be a great time saver. But I would not recommend the display for people working on color sensitive workflows; I was not impressed by the color matching capability of the screen.